NEW RELEASE SPECIAL! The Age of Embers will be on sale for $0.99 until March 18, 2019 before heading to its normal price of $3.99. Fresh off the highly acclaimed, massively successful Last War series comes a new chapter in the apocalypse from bestselling author, Ryan Schow. The Age of Embers is the first book in a new standalone series that takes place in the Last War universe. Undercover DEA agent, Fiyero “Fire” Dimas, is drowning in problems: a soul-crushing job, an inadequate marriage and a teenage daughter with suitors of the worst kind. Then there’s the drug dealers he double-crossed, and the "incident" at his kids’ high school. With the added complication of an attack on the city, can Fiyero pull himself together long enough to salvage his work, put his family back together and avoid the storm headed his way? 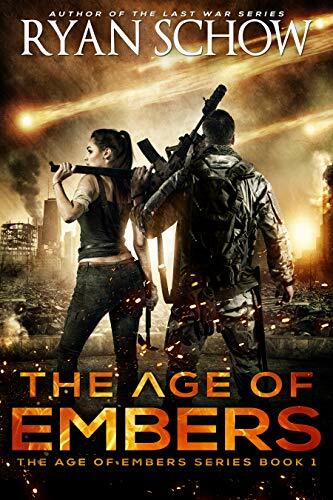 The Age of Embers is a brand new post-apocalyptic survival series written inside the universe of the best-selling The Last War series. This edge-of-your-seat thriller chronicles the harrowing journey of ordinary people trapped in an encroaching dark age. Get ready for great characters, big post-apocalyptic action and a no-holds-barred action/adventure series that just might hit a little too close to home. *The Age of Embers series can be read as a stand alone series or in addition to The Last War series. Both stories are written in the same universe on the same timeline. **This series contains the kinds of violence one would expect in an apocalyptic meltdown, some PG rated language and adult situations. This book is politics-free, which is to say it contains NO political viewpoints by the author or by the characters within.